Fifty-eight people were killed in the Las Vegas massacre last week, the deadliest mass shooting in modern US history. Seventeen guns were found in gunman Stephen Paddock’s hotel room, including a dozen that had been modified with a “bump stock,” an added part that allowed the guns to fire more rapidly. And up until today, anyone with access to YouTube could watch a tutorial on how to modify their guns in the exact same way. Now those videos are not allowed. A YouTube spokesman confirmed to Gizmodo the ban on videos showing users how to use a bump stock device. The update is now reflected in the company’s community guidelines. The policy change was first reported by The Telegraph. Ahead of YouTube’s recent ban on bump stock videos, the company’s guidelines prohibited “content that intends to incite violence or encourage dangerous or illegal activities that have an inherent risk of serious physical harm or death.” YouTube lists videos that feature “instructional bomb making, choking games, hard drug use, or other acts where serious injury may result” as examples of content that are not permitted on the site. 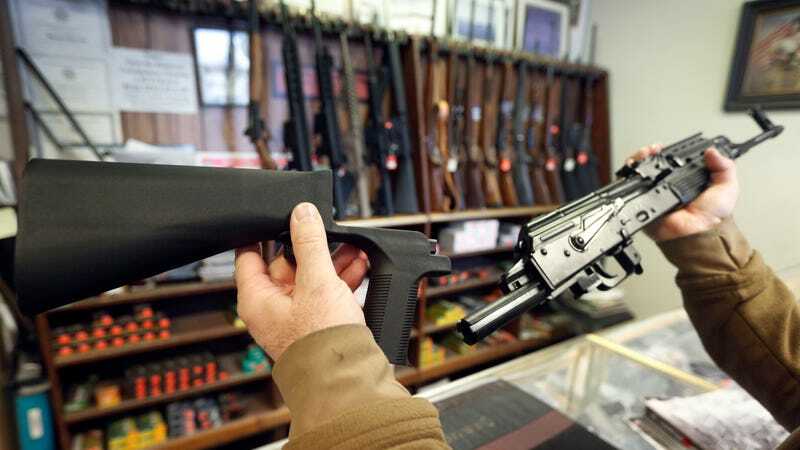 Replacing a gun’s standard stock with a bump stock device, which lets it fire at speeds approaching those of a machine gun, is not illegal under federal law—It does, however, afford users the capacity of killing dozens of people in seconds. And while YouTube’s recent ban on certain gun modification videos signals a small step toward better policing its website for dangerous content, the site is still a hotbed for gun tutorials. At the time of writing, it’s still easy to find instructional YouTube videos on how to convert semi-automatic rifles into fully automatic rifles. Some have hundreds of thousands of views. This casts some doubt over YouTube’s commitment to eliminating videos that make it easy for a gun owner to modify their weapon to be more deadly. By only banning videos specific to the mass shooting, it indicates that the video-sharing service will take action toward curbing dangerous content—in the aftermath of a deadly event related to said content. While it’s difficult to completely rid the platform of dangerous content in a snap, waiting until now to update its policy when these types of videos have existed on the platform for years is a gross oversight. We asked YouTube to clarify its policies regarding the gun modification videos that remain online, and we’ll update if the company responds directly.